Since the OG Rainbow Highlighters and Rainbow Highlighters Part Two posts went up, rainbow highlighters are getting even more popular! Milk Makeup has come out with a solid Holographic Stick highlighter ($28) that can be used on cheeks, eyes, lips, or your body. You can use it with or without makeup to give you a prismatic ethereal glow. On the last post I talked about the rainbow highlighter that was all over social media which has all the colors of the rainbow in one pan to make you sparkle like a beautiful unicorn fairy rainbow princess. Today I want to talk about highlighters that have been coming out in non-traditional colors. I talked about Jeffree Star who you might remember from MySpace on my previous liquid lipsticks post, but since then he has started his own YouTube channel which is SO ENTERTAINING I watch A LOT of YouTube and I HIGHLY recommend checking out his videos he is hilarious. Anyways, he recently came out with 4 highlighters which sold out very quickly. 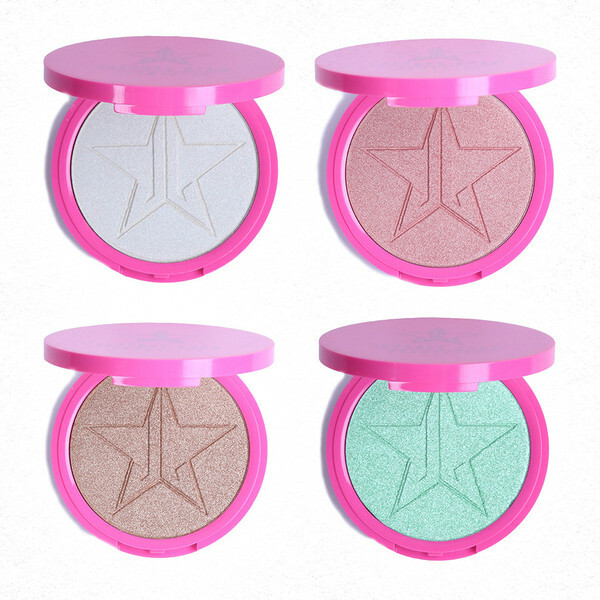 They come in King Tut (gold) and Ice Cold (white highlight that’s light enough for extremely fair skin) which are typical highlight colors, but since it’s Jeffree Star they are extremely pigmented and you’ll be able to be seen from space. He also came out with Peach Goddess which is a peachy shade which is a little different, and then the most unique shade Mint Condition which is a mint blue color, so fun! 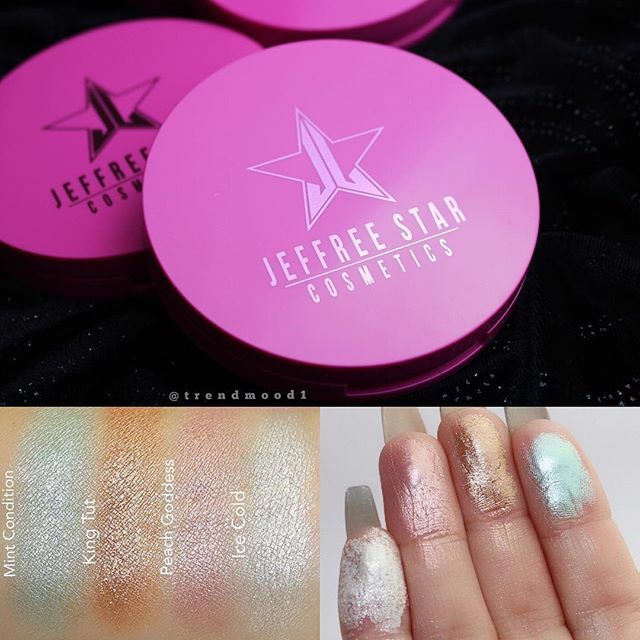 Swatches of Jeffree Star Cosmetics Skin Frost Highlighters. Pic by @trendmood1 on Instagram. So we’re all looking like sparkling mermaid unicorn princesses more and more everyday and I’m loving it! The latest beauty trend is rainbow highlighters. If you’ve never used a highlighter or are unsure what I mean by highlighter, let’s break it down. A highlighter can be liquid, cream, or powder and is meant to draw attention to wherever it is applied by catching and reflecting light and sparkle. Highlighters are what give you a blinging cheek bone and a jLo glow (you may remember them from my Lilly Ghalichi makeup post). They can be subtle, or lately people really want them to be seen from space so an INTENSE highlight is hot right now on Instagram and YouTube. You apply highlighters with a brush, a sponge/beauty blender, or your fingers. You can apply it before or after your face makeup (or both!) You can also layer multiple highlighters to make them more intense. If I want to really glow I will prime my face, then use a liquid highlighter on the tops of my cheekbones and down the bridge of my nose which I blend in with my fingers. I then apply foundation/concealer/powder/bronzer/blush and then put a final layer of highlighter on top to make it pop as a finishing touch with my makeup. Check out this post to see how I get a nice intense glow. My Beauty Trends: Liquid Lipsticks post is one of the most popular posts on my blog so with all of that interest I thought it was time to do a Part Two!